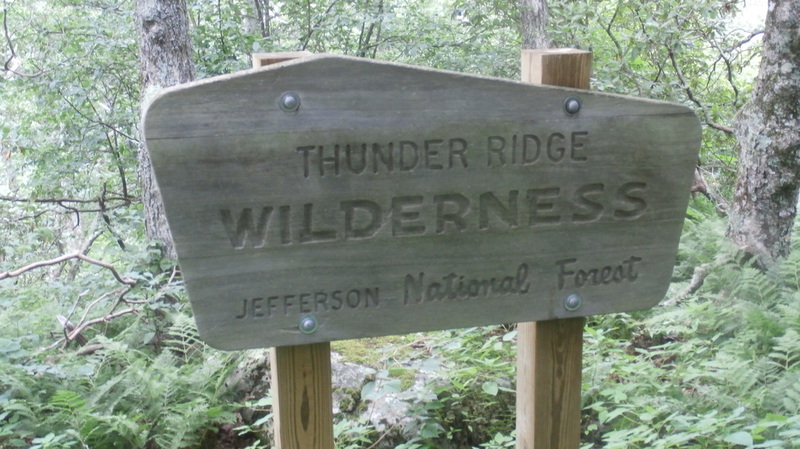 ​Thunder Ridge Wilderness is in Rockbridge, Botetourt, and Bedford Counties. 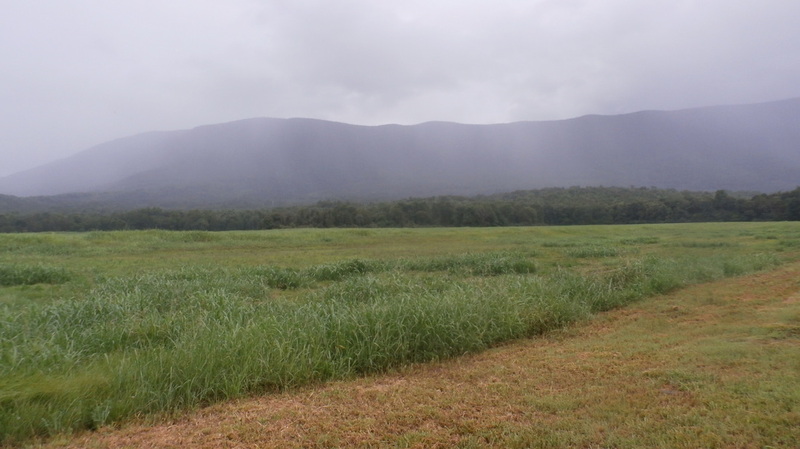 Established in 1984, this 2,428 acre treasure is the smallest wilderness in Virginia. However, its small size is not indicative of its true nature. Thunder Ridge Wilderness is rugged. Located below the crest of its namesake Thunder Ridge, this wilderness rises almost 3,000 feet from Arnolds Valley to Apple Orchard Mountain on the crest of the Blue Ridge. Thunder Ridge Wilderness is separated from the larger James River Face Wilderness by Petites Gap Road. Together, they create over 11,000 acres of nearly contiguous Wilderness land. At the very southern end of the Thunder Ridge Wilderness several small unnamed creeks come together to form the upper reaches of North Creek a tributary of the James River. The same is true for Hopper Creek. Numerous smaller streams come together near the Wilderness boundary to form Hopper Creek. North Creek and Hopper Creek are separated by Hopper Ridge. This ridge exceeds 3,000 feet above sea level. 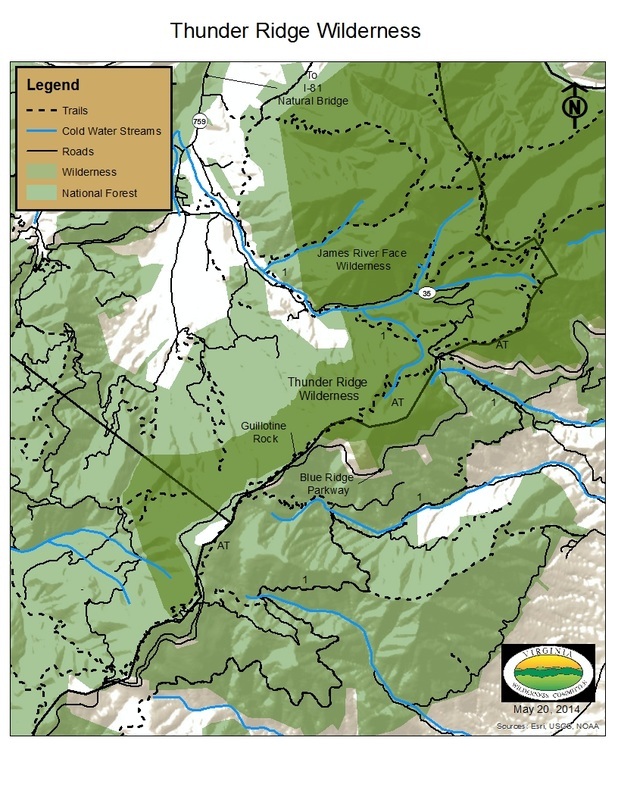 ​​Going north Thunder Ridge Wilderness is deeply incised by numerous small streams, all of them unnamed. These streams are either tributaries of Hopper Creek or Elk Creek. A walk up any one of them is a difficult, challenging task. At the northern end of Thunder Ridge Wilderness there is one designated cold water stream. 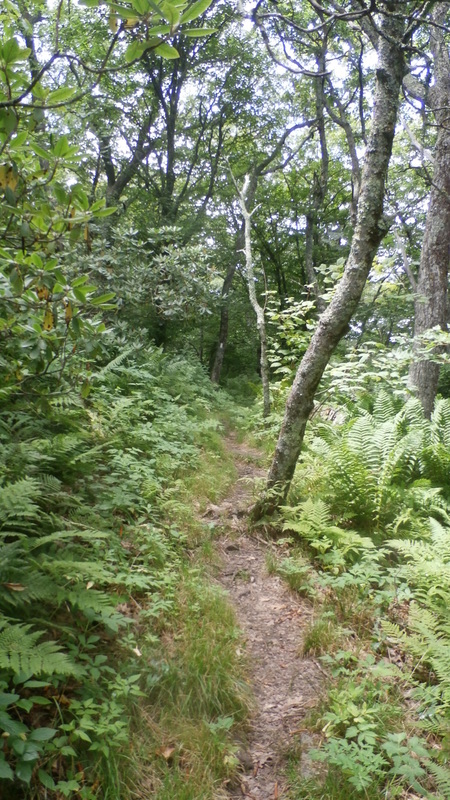 This unnamed stream, beginning just below the crest of the Thunder Ridge near the Appalachian Trail, cascades down the mountain to Elk Creek. Finally, just off Petites Gap Road at the very northern end of the Thunder Ridge, there is a small waterfall. There is no path to the falls and like much of rest of the Wilderness, to reach it requires a difficult bushwhack. The rock ledge above the falls provides a vista of Thunder Ridge and Arnolds Valley. 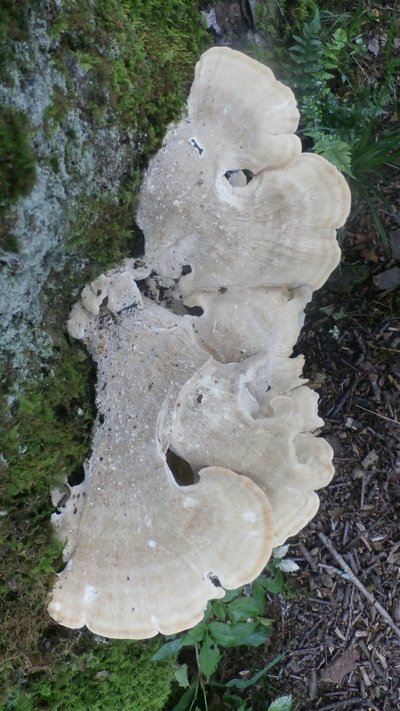 ​The crest of the Blue Ridge hosts many high elevation tree species including Yellow Birch, Black Cherry, and Northern Red Oak. Young Red Spruce dot the landscape near the crest of Apple Orchard Mountain. Trillium, Columbine, Pink Lady Slipper, and Mayapple thrive on the moist forest floor. However, this is the exception. 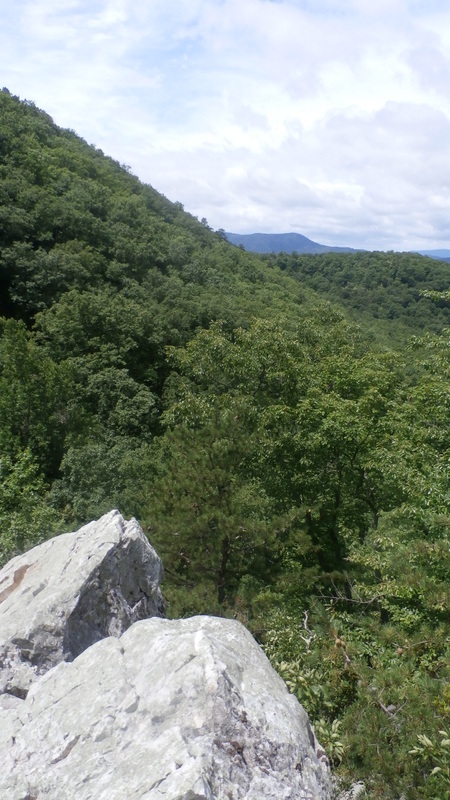 Due to its steep terrain, much of the Thunder Ridge Wilderness is characterized by southern hardwoods and drier forest types. Chestnut Oak and southern yellow pine dominate the landscape. 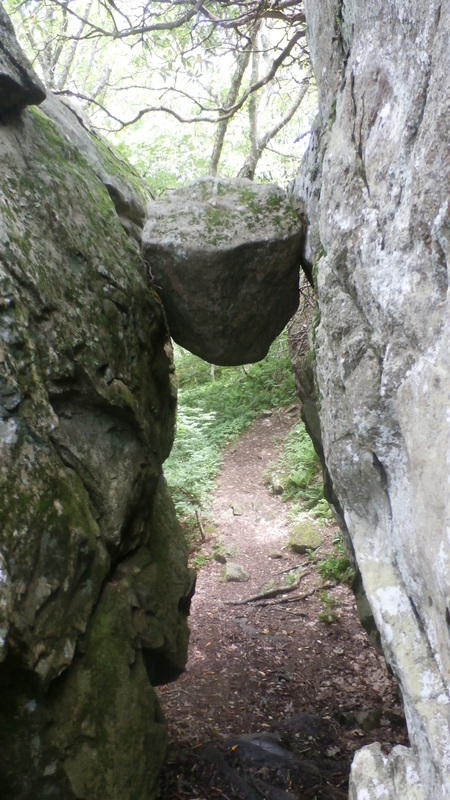 ​There are two trails in the Thunder Ridge Wilderness.